For Ray-Ban’s 75th Anniversary (Ray-Banniversary, can we do that? We just did), Ray-Ban is presenting the Ambermatic Collection featuring yellow polarized, anti-glare lenses that were developed in 1978. 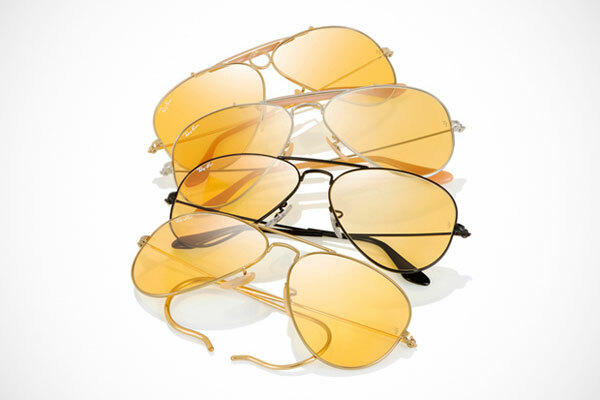 The yellow lenses will also darken according to light and temperature too, just like the original 1937 Ray-Ban Aviators. The Ambermatic Collection is available in four styles: two Aviators, a Shooter and an Outdoorsman, and will release this summer with only 18,000 made worldwide. Ray-Ban will also release a special anniversary campaign highlighting real-life stories of individuals who dared to defy convention, a link to Ray-Ban’s own pioneering ways. 18,000 worldwide! I need to try and get myself a pair – the lenses just look so cool, I want to see how they change with differing temperatures and light levels.